Over the years we've given the rugby meeja a lot of stick here at Harpin Manor for overuse of the headline 'Italian Job' whenever Irish opposition involves a team from the boot-shaped nation. When it comes to what I have in store for this coming weekend however, it's extremely difficult to avoid using it. I have always wanted to be able to do a 'hat-trick' of Six Nations matches in the same weekend, and maybe the logistics of travelling from Dublin to Twickers in time might hold me back when it comes to senior level, but I have found an alternative means of of getting it done. 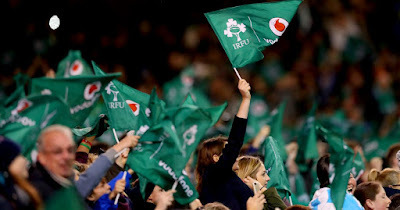 Tonight, I go to Donnybrook to watch the Irish Under 20s in Donnybrook, and at Sunday lunchtime I'll be returning there to watch the Irish Women. Oh, and there's the small matter of the men on Saturday as well. It's not often I miss watching Leinster playing live [either in person or on d'telly]; on average over the years I'd say it's less than once per season. But tonight I must make a choice and my 'entire Six Nations experience' plan means something has to give so I'll be relying on those watching on Twitter for updates while I'm in Donnybrook. As for our coverage here on HarpinOnRugby, our top contributor Ciarán Duffy has graciously offered to step into the void and provide both a preview and match writeup for Edinburgh v Leinster.